OK…let’s get this Christmas decorating party started! If you haven’t begun yet, that’s perfectly fine because everyone still has plenty of time. I started with my little tree and then moved on to the front porch. 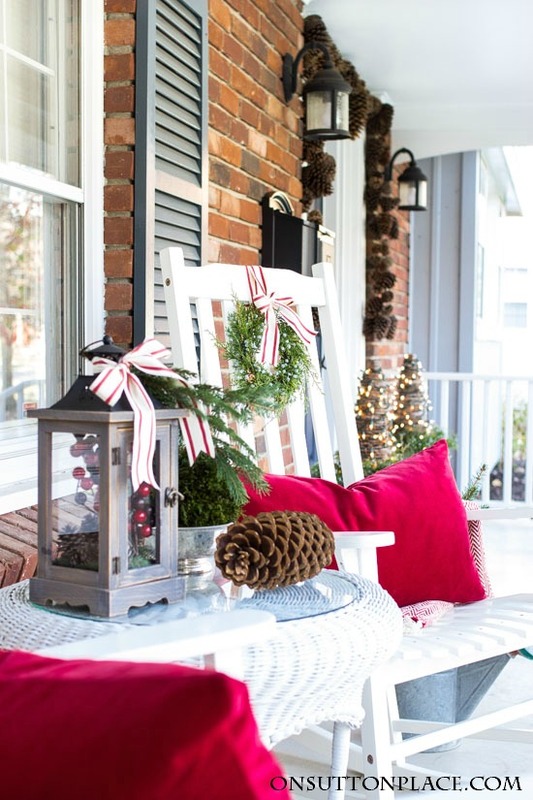 Christmas porch decor around here usually involves pine, white lights and pops of red. This year is no different. I used decor I already had, but to refresh things a bit I added a few new things. I added two budget-friendly throws I ordered from Amazon. Some years I use throws and others I don’t. I re-used old red velvet pillows so I thought the new throws would brighten things up. *All sources will be listed at the end. I love to shop local when I can…and I found the little juniper wreaths at a farmhouse style shop here in my hometown. I got juniper garland there last year so I was happy to add the wreaths. If you are ever passing through Northwest Ohio, the shop I’m referring to is called The Homestead Collection. It’s at Exit 161 on I-75. Definitely worth a detour! Everything else has been seen before but not in this combination. 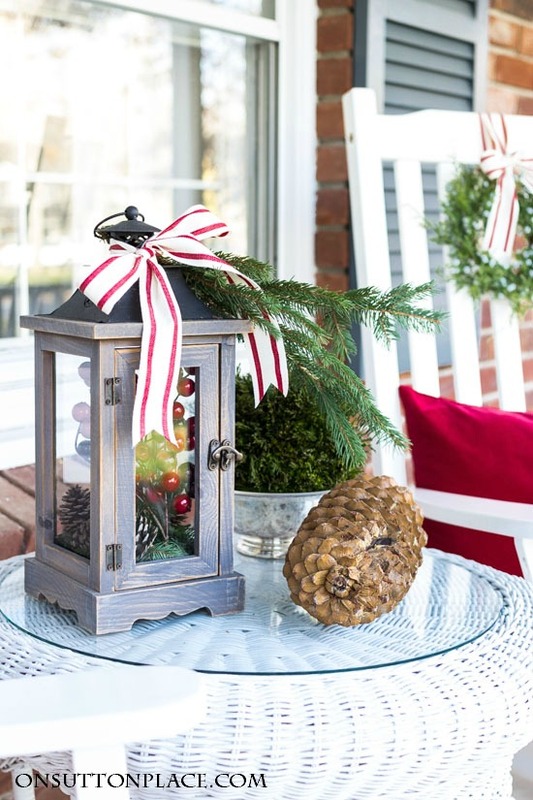 Striped ribbon (saved from last year) on the wreaths and lantern, along with greenery, pine cones and a few red berries finishes off the table. I don’t have any pine trees that I can take cuttings from, so I went over to my Dad’s and he helped me get some clippings from his back yard. I attached a few to the lantern and then filled my grandmother’s watering can. I love the way the green pops off of the red throw and pillow. It’s an inexpensive, homespun look but it makes me smile every time I step out on the porch. Add something new. You may think this is defeating the purpose, but there’s no harm in updating your things by adding new accessories. Even a couple of new bolts of ribbon would brighten any space. Don’t think you have to re-invent the wheel…just give it a refresh. Switch things around. Bring the inside out. Use something from your indoor decor outside. If you have always hung the same wreath over your mantel, use it instead on your front door. Use your stairway garland around your front door. Add fresh greenery. Even if you don’t have any Christmas porch decor at all, start with fresh pine cuttings. If you don’t have pine trees, look around and see if a friend or family member has some. You can buy fresh pine for a great price at places like Costco or Sam’s Club. It’s pricier at nurseries and garden centers so stay clear of those. Reminder: The Black Friday/Cyber Monday sale at Society6 continues until tomorrow, November 28th at midnight PST. They are offering 20% off everything with free shipping. Click HERE to see all my Christmas designs. No coupon code needed! Thank you for spending a few moments of your day with me. « Tabletop Christmas Tree | Easy, Fast & Festive! So fresh and simple! Love it! The front porch looks very nice and festive! Love the wreaths you put on the chairs! That is my challenge to myself every year, use the same things in fresh ways. Your porch is lovely. 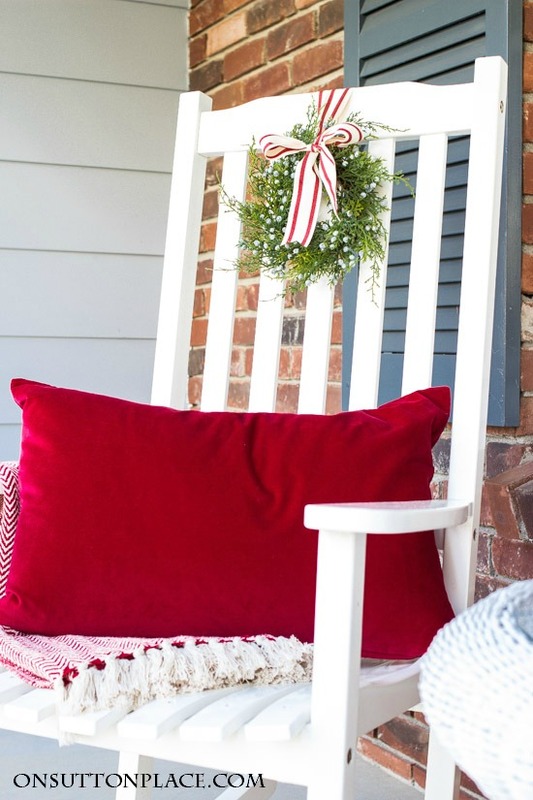 Your porch looks wonderful in red and white! First look at this new ite for me. Love what I have seen. Hi Ann!, love your cozy, welcoming porch! Sipping a cup of hot chocolate would be so fun out there. Looks like I need to make another stop at Homestead to get some of those cute wreaths. Instead of a metal watering can, I use an old minnow bucket and put pine branches in it. The minnow bucket reminds me of my grandparents and Dad and our many fishing adventures at our Canadian cabin. Your porch is one of my favorite spaces! Thank you for sharing! I will be hanging small wreaths on the back of my porch chairs. Love it all! Everything you share is beautiful. Whenever I need some inspiration or want to look at lovely things/ideas, I visit you, including your older posts. You share great tips to help jump start my own decorating. Hope you are having a wonderful holiday season… your decor looks like it. Always great ideas. Looks really good. Ashland Ohio and go to the Parsley Pot on Middle Rowsburg in Ashland. You would love it. Great products and just a fun locally owned store. Gorgeous, and i adore the pillows. 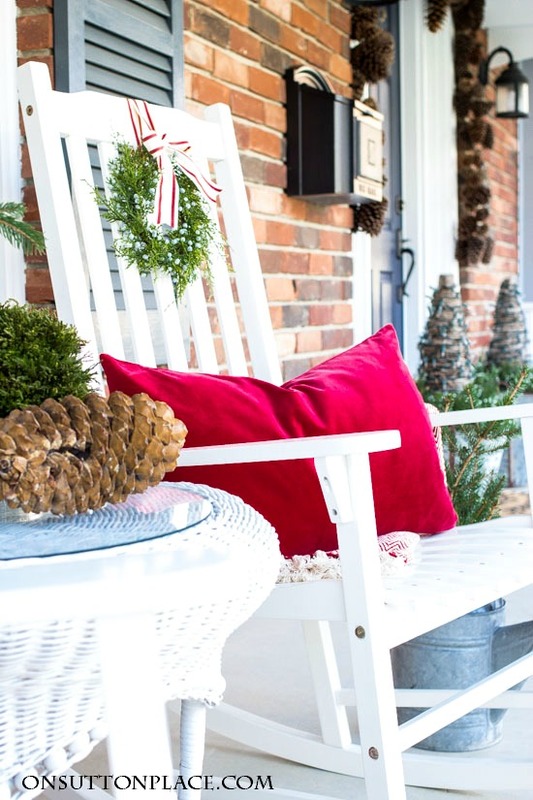 I think your porch looks decidely like the perfect Christmas space! The addition of your red velvet pillows gives a warm, inviting look to your chairs. The more velvet I’m seeing in decorating, the more I’m loving it. The whimsical red and white wide striped ribbon really plays well with her red and white herringbone pattern of your throw. Ann, you are the “queen” of beautifully constructed vignettes and your little table is proof yet again, of your enviable style. We spent Thanksgiving and the day after at my son and his family’s home. A wonderful cozy family occasion. On Friday, while I entertained the toddlers, my daughter-in-law worked tirelessly from 8:00 a.m. to 6:30 p.m and their home went from cozy Fall and Thanksgiving to an enchanting wintry, Christmas wonderland. I was humbled by her endurance and her quick decisions as to place the right decoration in the perfect spot. The children were awed each time another string of lights clicked on the mantels, and the long curved staircase. My son loves a house fully decorated for Christmas and he gets that each year, she does just enough that each room in their large home sings Christmas. After watching her and now viewing your lovely porch, I’m feeling the push to begin my Christmas decorating a bit earlier than usual (well, usual for me). When my husband asked me a couple of hours ago if we could start decorating today, the push felt like a shove, I feel I must begin. I love the greens you’ve stuffed into your vintage watering can and used to make your baby wreaths for your chairs. Question: Do you have to change out your greens throughout the decorating season or do they stay that beautiful throughout? I love your decorating ideas! I have a question. Where did you get your grapevine trees by your frontdoor with the lights on them? I just love your decorations. Now that Thanksgiving is over I can take down my fall decorations and decorate our porch. Keeping with the classic traditions, I too love the green and red. One request, can you show a picture of your front door decorations. Thank you for all your wonderful ideas. Have a beautiful day!! Hi Addie…yes I’ll be showing the front door and the whole porch next week. Thanks for your comment! You have definitely inspired me to do something different on my porch this year. Thanks. I love your porch. Pine is something we have an abundance of in Northeast Florida! 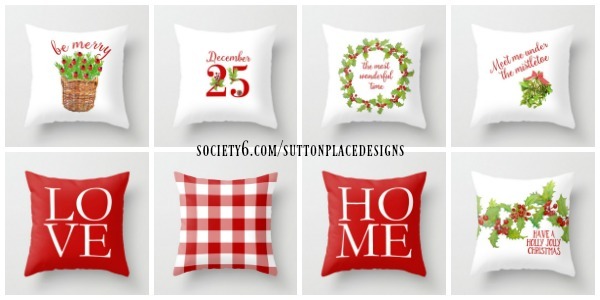 I just received 2 of your Christmas pillows and can’t wait to use them. We are moving to Denver right before Christmas into a little cottage home. I can’t wait. Your porch just reminded me a couple of rocking chairs out front would be perfect. Your decorations are perfect and my mind is racing! Thank you! Love this, simple and classic!!! 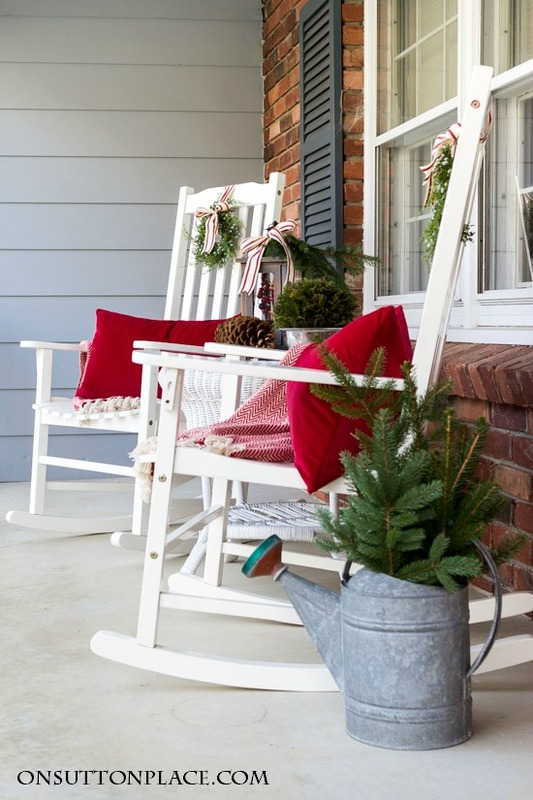 Love your porch.it looks so welcoming. 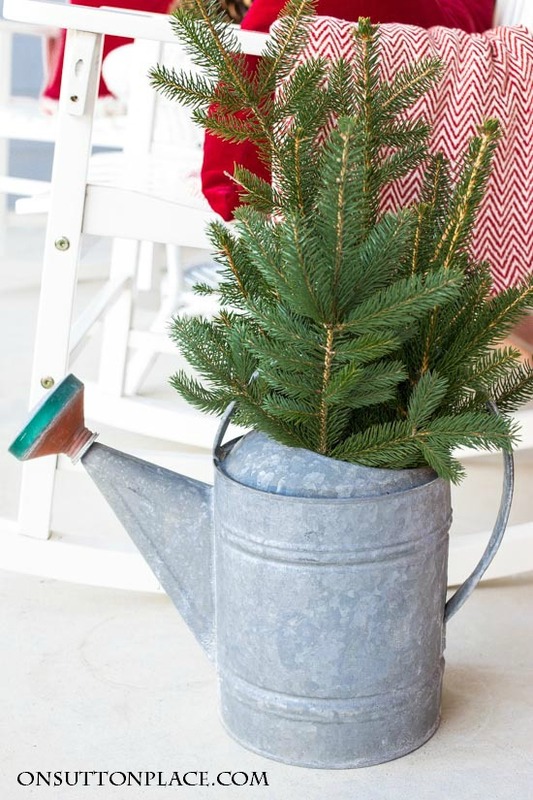 I love the classic colors of Christmas and the fresh pines in the watering can made my heart smile:). So I live in Montana and the snow will blow up and drift sometimes on my porch….any ideas? I am not keep on frozen snow covered pillows. I live in Ohio and some years we have a lot of snow by Christmas but our porch is covered and a bit protected so it doesn’t drift too much. You can still add pine, wreaths, berries, garland, pine cones etc. All that will survive ice and snow. Happy Holidays! It is indeed a warm, inviting look. I always appreciate how you keep things simple yet beautiful, without a lot of overdone-fussiness! And I completely concur with your outlook that favorite things can be used from one year to the next just by arranging them in different combinations, or adding one or two new elements. Thank you so much for the inspiration! Ann Your porch looks lovely & Christmassy & inviting. I love your rocking chairs! Are you able to sit outside there? What’s the weather like? Hi Shirley…I sit on the front porch in the spring, summer and fall almost every day. Right now it’s too cold so I’m not actually sitting out there! Were putting the outdoor decorations up today. 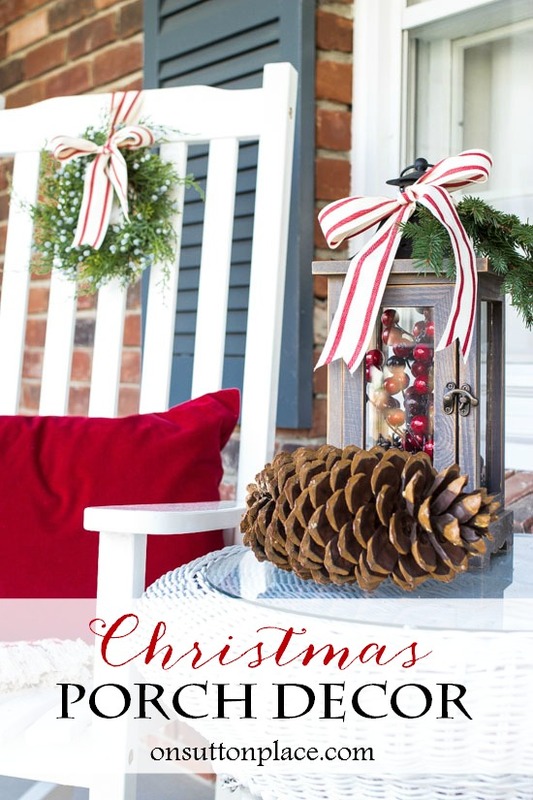 Love your porch and those little wreaths are so cute! I’m doing new cushions on our chairs and shopping pillows from my collection. Then on my walk I’ll collect some pine cones for my lantern! Red and green,so classic and pretty. Dear Ann, Lantern would be stolen as well as chairs and pillows. This is the non wonder of Cleveland, Ohio. I did put up across the porch white snowflake lights. Red and white swagged ribbon across the porch rails. My Santa flag, my newest tin can creation of snowman wind chime and my new tree made from tomato cage and garland. White lights of course. I must confess I put colored lights around living room windows back on the November day of 70 degrees because it did snow the next day. No frozen fingers. Hip hip hooray. I would love a genteel porch nut the stray cats would be in the chairs and cat hair on the pillows. I love to decorate and what I did works for here. I forgot the green prickly garland around the outside door and down the banisters with red bows on the ends. Even put a red bow to make the mailman smile on the mail box. there will be glass jars I made into candle holders with wire handles I will hang on my plant hangers in the front garden. they look very smart when it snows. I do love to decorate for Christmas. Merry Christmas to you my dear Ann. Well Jody it sounds like you have everything totally under control. Your home sounds very cozy and welcoming…Happy Holidays!